It's the end of the year, and we have just 12-hours left to meet a $5,000 matching gift challenge from Scan Design Foundation. We appreciate any support you can give. You've seen it, the magic of the outdoors - the dancing Northern Lights, an eagle swooping down to nab its prey, or a perfect pyramid-shadow cast by a mountain at sunrise. The moment takes your breath away. You feel awe-struck. And grateful. And connected. As a Mountaineer you play outside and witness the power of nature often. It touches your heart, transforms your body and mind, and connects you to people and places. This is what we've done as Mountaineers for 110 years. Today, with your tax-deductible year-end donation we will create this moment of connection for the young and seasoned, for people from all walks of life and from all around the world. Please give what you can by midnight tonight to help us meet a $5,000 matching gift challenge, generously offered by the Scan Design Foundation. Your gift of any amount makes a difference. P.S. 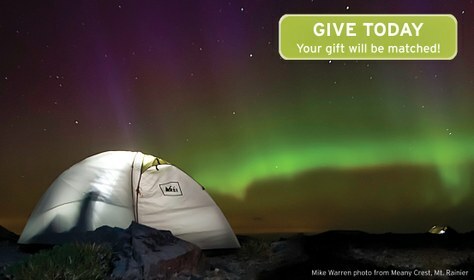 Your gift of $10, $110 or even $1,110 will connect people with the outdoors to enrich their lives and create protectors of our wild places, and help us meet the matching gift challenge by midnight tonight! Plus, with good tidings on our side, it might just help propel the Huskies to victory on the field today (Go Dawgs! ).